A couple of days ago the Japanese website muevo published an introductory article about BUTAOTOME, as part of their “pick up artist” feature. And here is a translation because Why Not! You can read the original text here. BUTAOTOME – Pay attention to this addictive chaos world. Dance to this ensemble full of freedom! The 4 active members are Ranko (Vo), Comp (Ba), Paprika (Key), Ranko no Ane (Performance). The members were originally drinking companions and they formed the group in 2009 under the concept of “Let’s do something fun!”. They started as doujin circle with the production of songs related to Touhou Project and they continued with publishing videos and participating to Touhou Project-related events. Also, after making the music, they costantly released them with a focus on spot sales at Comiket Market. Their activity steadily expanded and now they play live at big festivals like MINAMI WHEEL and MITSUBACHI FES. In addition, they had live events with the rock band sokoninaru and the idol group You’ll Melt More!. BUTAOTOME, who started from Touhou Project, is now establishing a position as artists. Now, in their private studio “Butagoya studio”, the members are in charge of making music, from arranging, recording, mixing to mastering. In addition, Ranko no Ane is in charge of the artworks, the website, the goods’ design etc. The DIY spirit that has been through since the band’s formation is still going strong. While there are a lot of cool songs due to their melodic phrases and speedy development, it is also attractive that the members themselves are very unique. Only the vocalist Ranko has a human appearance. 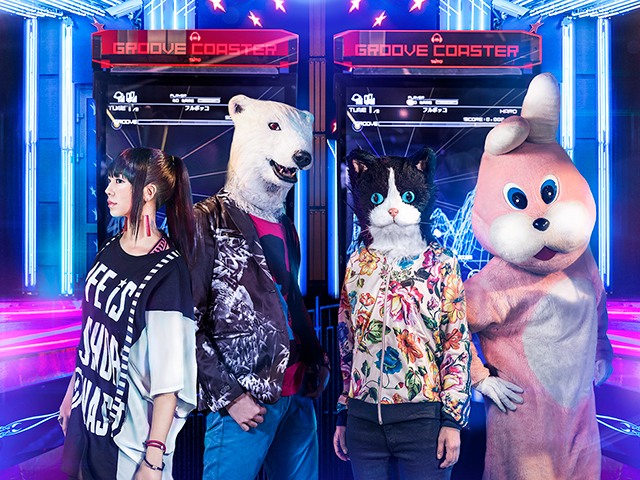 The other members take appearances of a polar bear, a cat and a bunny respectively. Of course this is also while they are performing. They have unique characters and songs. However, their quality is real. We would like to introduce you about the charm of such BUTAOTOME. Here is the lead number of the major debut album “Furubokko”, released in March 2017. This is a song filled with BUTAOTOME’s charm, with their characteristic rhythmical melodies and Ranko’s powerful vocals living at the maximum. Starting with the bizarre ensemble. The dancing bassline seems to go anywhere with freedom, it adds excitment to the song and at the same time it firmly supports the entire thing. Together with the driving drum, the personality of each part is exposed and it seems they move around too freely, but they wonderfully and superbly interwine, this ensemble becomes quite an habit. And then, after all of this, there is Ranko’s soulful voice. From the husky low tones to the bewitching higher ones, the extension of her expressive power is something to remove your hat for. Her powerful singing voice that fully uses her skills tighters up this song full of individuality and it highlights more powerfully. It is a nucleus that firmly supports the whole thing while leading the band. However, it can’t stay calm. Her singing voice screams and goes all over the place as it has a soul. BUTAOTOME boasts of their chaos world where the personality of each member is exposed. This mysterious world view is irresistibly good. The original song is “Koyoi wa Hyouitsu na Egoist ~ Egoistic Flowers”, the theme song of the final boss in the doujin game “Touhou Hyouibana ~ Antinomy of Common Flowers”. Speaking of Touhou Project, there are many speedy songs in shooting games, but their speed further accelerates with this peculiar band ensemble and singing voice. The solid sound pleasantly goes through with a surprising speed, it keeps being addictive. With the band sound that kicks out a violent speed, mixed with the piano that adds a stylish atmosphere, this is a song overflowing with sprint and you can also get a danceable impression. It’s so fun that the body dances by nature. This high quality song will pierce through the heart of not just Touhou fans, but also a huge variety of music listeners. The cynical lyrics written by Comp have an unique word choice, it’s very impressive. Please pay attention to the lyrics. Also, it seems that the illustrations used for this MV are also made by their own. We would like you to enjoy them together. BUTAOTOME will celebrate 10 years of activity next year. From now on, they will further boost the Touhou Project, loved by the members, while making further leap as artists. Their homepage and Twitter is updated at any time with news about lives and spot sales. We would like you to experience this chaos world that will become addictive once you listen to it.